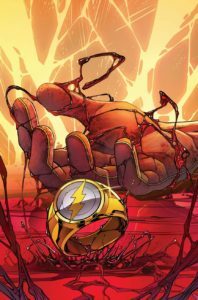 DC has posted the official five-page preview for next week’s issue of The Flash, which is Flash #31. In it, Barry faces off with new villain Bloodwork and his admittedly disturbing powers. You can see the pages at The GWW, and the issue will be available on September 27th. This entry was posted in Flash News on September 23, 2017 by Lia.